It seems that the puff of the biggest fight of the year has gotten the attention of the Russian president. Arguably the single biggest event in sports this year, (getting more attention than Tiger Woods comeback or Serena William‘s US Open, break down,) the Conor Mcgregor vs Khabib Nurmagomedov fight has been everything and more. The event was big – pre, during and post. The pre-fight press conferences and face off broke UFC record for highest viewed press conference ever; the fight’s attendance broke highest attendance record in UFC history, and the anticipation for a rematch is something already estimated to rack in more money than the original fight, going by the amount of interest shown by sponsors, analysts and fans. And now it seems that even Vladimir Putin, president of the second most powerful nation in the world has gotten caught up in the hype. Following the fight, Khabib announced during the post-fight press conference that the silver lining to the UFC retaining his title and earnings for his unprofessional conduct after the match was that he received a call from his president. He even managed to let out a smile (after a seemingly gloomy press conference), following the statement. 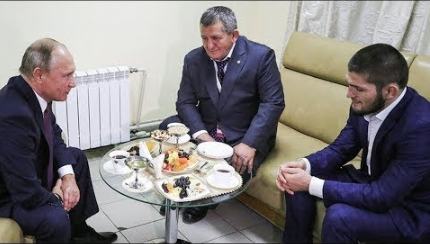 On Wednesday, the president kicked it up a notch, inviting Khabib and his father Abdulmanap Nurmagomedov to lunch. The three of them had a sit-down and the president started off by congratulating the champ on his win. The highlight of the meeting was when Putin pleaded with Abdulmanap not to punish his son so severely. The Dagestan (Khabib’s hometown) Islam culture, encourages strict parental discipline, as a matter of fact, the famed Khabib still lives with his father as his culture permits. Following the fight Abdulmanap issued a statement, stating that he will punish his son much more than the UFC did. This is why Putin tried to plead on Khabib’s behalf for the father to go easy on him. A little bit reminiscent of Nigerian culture. 지난해 올해의 선수상을 박성현(25ㆍKEB하나금융그룹)과 공동수상한 유소연은 올 시즌 아직 우승이 없고, 개막전 퓨어실크 바하마 클래식에서 3위를 한 것이 가장 좋은 성적이다.